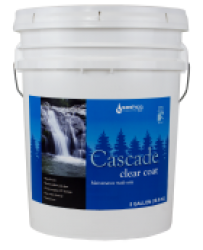 Sashco Cascade Stain is a clear, exterior water repellent—the finishing top coat of Sashco’s Cascade staining system. Cascade provides added exterior protection against damaging UV rays, molds and fungi. It dries with a modest sheen and adds depth to the appearance of stained logs. • As with all Sashco Cascade stains, coverage will vary depending upon roughness and porosity of the wood.